With Dr.Explain you can build an online manual as a set of HTML pages and then upload it to your web site. Each page is usually devoted to a specific topic and includes cross-links to other HTML pages. There is a table of contents that allows fast navigation across the topic areas. Additionally, pages may contain special navigation links: next page, previous page, indexes, etc. HTML is preferable if your software is platform independent and users can also read the help file in their Web browsers on any operating system. Storing help files as HTML pages on your web site is also useful if you update your documentation frequently by adding new topics and pages. In this case, users do not have to download the entire help file after each update. You can easily plug your help pages in the structure of your product or company web site. 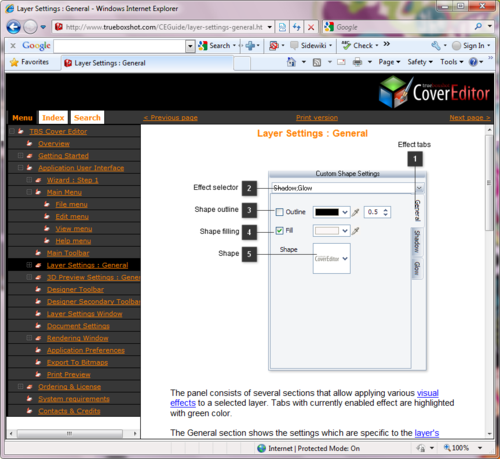 Dr.Explain will help you to customize your on-line manual by means of custom CSS support and HTML templates editing.